Claire de Hedervary, daughter of Lehel Héderváry de hévízgyörk, Member of Parliament of the Independence Party (led by Count Albert Apponyi), and Klára Radó, was born in Budapest. Her maternal grandfather, Sámuel Radó was one of the founders of the Hungarian News Agency (MTI). After her father's death, her mother became the Paris correspondent for several French and Hungarian newspapers, while Claire went to high school in Brussels and started her higher education at the University of Louvain. When at the outbreak of the war Louvain closed down temporarily, she was evacuated with the other students to France and through her mothers' academic contacts she received a fellowship enabling her to finish her studies in the United States. First at Harvard University (MA in Economics and Public Administration) and at Columbia University (PhD) in Economics and International Law. To supplement her income, she worked, among other jobs, as a part-time unskilled worker at the Goodyear Rubber Co.
After she finished her studies, Claire war recruited by the United Nations as an Economic Affairs Officer and was assigned to the Middle East section of the Technical Assistance administration for Developing Countries. When in January 1957 the UN set up the Special Committee on the Problem of Hungary, Claire offered her services to the project and during the four years that the question was on the agenda, she was attached to the substantive secretariat of the Committee, fulfilling a great variety of tasks such as for example collecting and analyzing the information, and interpreting the testimonies of witnesses. When the Secretary General appointed a Special Envoy to underpin the work of the Committee, she became his advisor. 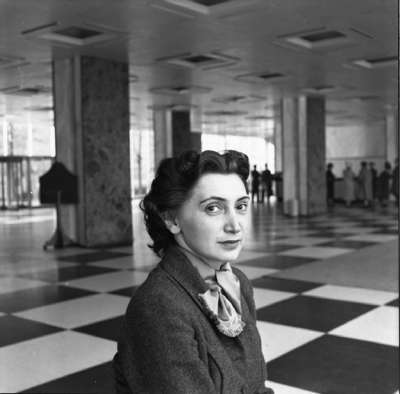 After the Hungarian question was removed from the UN agenda in 1962, she continued her career in the Political Department of the UN as Chief of the Peaceful Settlements and Political Assessments Division and retired in 1981 from the Secretariat of the UN as one of the Directors of the Political Department. Throughout her career in the UN, she also organized, participated or presided study groups and seminars. She was a Co-founder and President of the Women's Group, an association whose purpose was to improve the status of women officials in the UN and its affiliated organizations. She also presided the Inter-agency Committee advising the Secretary General on Personnel and Administrative matters. Claire maintained working relationship with the UN after her retirement: from 1981 to 1984 she was a Member of the Belgian Delegation to the General Assembly, and in 1990-1991 was Commissioner General and Special Representative of the Secretary General in Japan. Among others, she was awarded the Commander Class of the Order of Leopold II, the Imre Nagy Memorial Plaque and a special medal issued by the Hungarian government on the 50th anniversary of the 1956 Hungarian Revolution. Currently, she lives in Belgium and is the President of an institution of higher education, the United Business Institutes.